Supergirl takes on Facet, in a last ditch effort to stop her plans to make Supergirl over in the image she deems best. Reduced to fighting Facet hand to hand, there seems to be no recourse towards defeating her, until Alex and the DEO arrive to provide assistance in the form of a specially made bullet that is able to penetrate Facet's nearly impenetrable hide. Supergirl jails Facet and returns to her life, stronger for her experience and a walking testimonial to her belief in "Stronger Together". Story - 5: If you can ignore the implausible idea that a manmade gun could fire a bullet of any nature with enough force to penetrate a skin tough enough to stymie a Kryptonian, this has been an excellent to close to a very well written series. If you can't, subtract half a point for that plot fall and enjoy the rest. 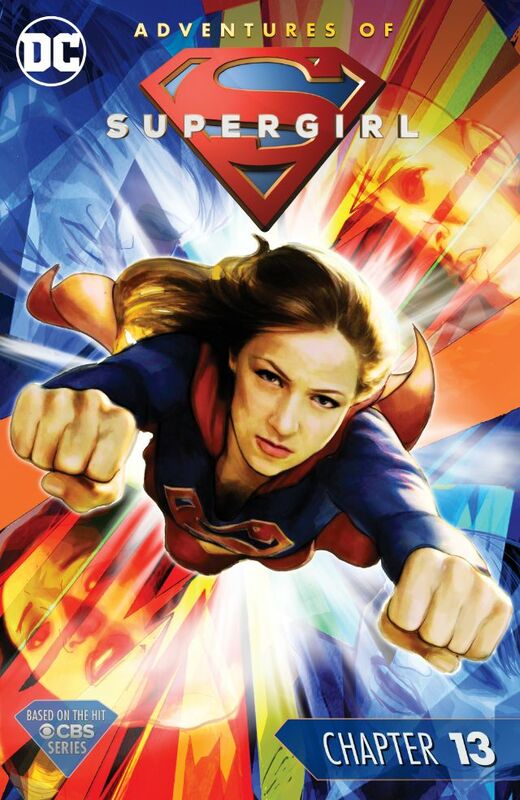 Adventures of Supergirl could have just been a lightweight, tele-series tie-in, delivering little more than flaccid almost stories, hoping to coast on the popularity of Supergirl in another medium. Instead readers were treated to a top form series from a writer who genuinely understands and likes the character of Supergirl. It's a shame that Gates and company don't have more time. More than likely, this is the end of Kara's adventures based on Supergirl, which is probably being placed aside for the coming Supergirl series in the canon universe, but it's not for naught; the best thing about a good story is that you can read it over and over again. Art - 3: I'm on record of not being an advocate of the art here, and that hasn't changed. Usually it's the other way around, pretty pictures and horrible story, but I wish Gates had been given a closing artist up to the weight of his story. Cover Art - 4: Straight-forward and unimaginative, but still nice.